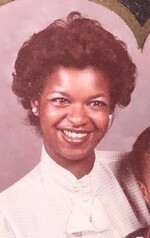 Sharon Denise James Cantlow was born June 26, 1960 in Atlanta, Georgia to Mr. John Lewis James, and the late Mrs. Annie Clyde James. Sharon made her transition from life and into eternal rest on July 8, 2018. Sharon accepted Christ at an early age and was raised in Greater Vine City Baptist Church. She was educated in the Dekalb County Schools System, graduating from Walker High School in the class of 1978. Sharon worked for the Palm Beach County School Board as a dispatcher for many years. During her time away from work, Sharon enjoyed singing, dancing, tree-work, and taking care of family. More than anything else, Sharon will be remembered for her beautiful smile. Sharon Denise James Cantlow leaves to cherish her memory, sons, Anthony Lamar Cantlow of Atlanta, and Jaron Fleming of Tampa, Florida; father, John James; brother, Rafer Lamar James (Angela); sister, Joyce Ann James; three uncles, two aunts, nephews, Ken, Brandon, Kourvoisier, Cameron, Knikko, and Melvin; nieces, Crystal, and Shatara; special friend, Cheryl Patterson; and a host of great-nieces, great-nephews, other relatives and friends. Celebration of Life Service will be held Saturday, July 28th, 2018, 1:30 pm, at Herschel Thornton Mortuary 3346 Martin Luther King Jr. Drive SW Atlanta, Georgia 30331. Interment . Public Viewing will be Friday, July 27th, 2018 10:00 am until 8:00 pm at Herschel Thornton Mortuary 3346 Martin Luther King Jr. Drive SW Atlanta, Georgia 30331. To send flowers to the family of Sharon Denise Cantlow, please visit our Heartfelt Sympathies Store.